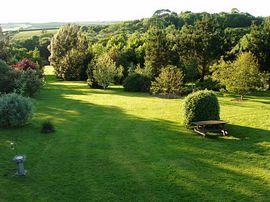 The Hayloft has its own private garden and guests have access to 7 acres of land including a mature tree garden and a picturesque wildlife pond. The accommodation comprises of an open plan kitchen and living space upstairs, with wonderful views of the garden and surrounding countryside. 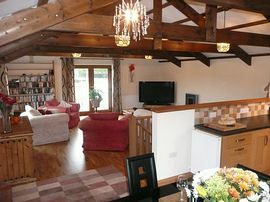 The living room has a gas flame fire and Freeview television. This is an ideal space in which to relax and enjoy the company of your family and friends. 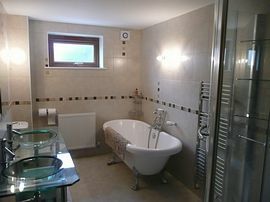 (one en-suite with toilet and shower) and one twin room. There is a modern family bathroom with a luxurious bath and power shower. The Hayloft would suit families or small groups of up to 6 friends, who wish to relax in the stunning Cornish countryside. Probus is the central point in Cornwall and with both coastlines within 20 minutes, the choice of activities and adventures is endless. 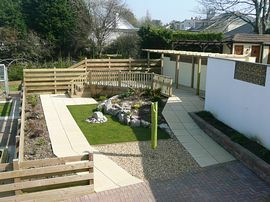 The village boasts excellent local amenities including restaurants, convenience stores and a pub. When staying at the Hayloft you will receive a friendly and warm greeting, including a welcome hamper, with all the essentials for a Cornish cream tea upon arrival. 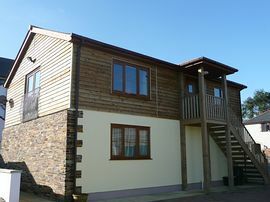 A modern property in Central Cornwall. A private garden and access to 7 acres of countryside. All Bed linen and bathroom towels. Towels must not be taken to the beach please. All kitchen linen provided. The Hayloft has a private garden as well as having access to 7 acres of family owned countryside including a mature tree garden an small wildlife lake. Local Services: The Hayloft is situated in the vibrant village of Probus less than 5 miles away from the Cathedral city of Truro. Probus has convenience stores, a petrol station an a farm shop. The local fish and chip shop is superb. There is also an award winning restaurant 'The Lamplighter' and an Indian restaurant in the village. The village is also served by a good pub 'The Hawkins Arms'. Leave the A 30 from the Ladock / Grampound Road junction, which is after the named Highgate Hill Junction. Follows signs to Ladock and drive through Ladock until you reach a junction, which has options to turn to Probus or Truro. Drive into the village and then turn left onto the shared driveway for The Hayloft and Pencarrow, which is beside the second speed bump on the main road.